Where were you tonight? How did that meeting go? Are you seeing someone else? What qualifies you for this job? These are just a few of the usual questions we might answer in a day. A typical answer to the last question would include a series of �whats�: what experience you have, what you studied in school, and what you do well. In Control the Conversation, the authors guide you in crafting a response to a question, not just an answer. A response should be multi-dimensional and include relevant and compelling information that goes beyond a mere answer. 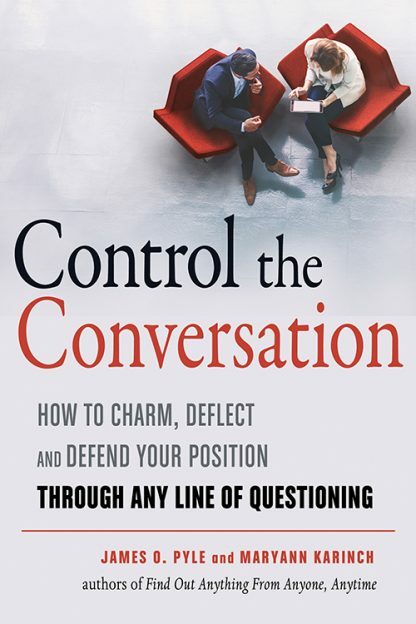 No matter the question, Control the Conversation will show you how to steer every exchange in your favor. James O. Pyle is a human intelligence training instructor for the combined services of the Department of Defense. His �active� retirement from the US Army includes writing, acting, and inventing, and he performs as a mobile DJ in and around his home in Springfield, Virginia. Maryann Karinch is a body language expert and the author or coauthor of 28 books, including The Art of Body Talk, The Body Language Handbook, How to Spot a Liar, and Find Out Anything from Anyone, Anytime with James O. Pyle. She is the founder of the Rudy Agency, a literary agency based in Estes Park, Colorado.